Thinking of setting up your first aquarium? It might seem complicated, but actually, establishing a basic set-up can be fairly easy. There are just two important rules to remember: take your time; and don't get too ambitious. What matters is not having the world's most exciting aquarium straight away, but establishing a healthy aquarium that's easy to look after, and learning in the process. It might sound a bit backwards to think about the fish you want first, but doing so can help you to set up your aquarium in the right way. Of course, you should not actually buy your fish until your aquarium is ready, which could take several weeks. If you fall in love with particular fish in the meantime, you local fish shop may be willing to keep them for you. Because looking after a marine aquarium is much more complicated, it's best to start with freshwater species. Choose hardy fish like danios, rainbow fish, tetras or barbs. Many of these fish are beautiful and playful so you don't need to worry that playing it safe will result in a boring aquarium. When choosing, make that sure you know what food your fish will need and that they can all live happily together. The first piece of equipment you'll need is the aquarium itself. Think about the fish you have chosen. The aquarium will need to be big enough for all of them. Some fish are only happy when living in shoals of a certain size. A good rule is to make sure there will be a gallon of water per square inch of fish. This means that even if something goes wrong with your filtration system your fish will be able to get enough oxygen whilst you sort it out. It's important to choose an aquarium with a good lid, especially if you will be keeping fish who like to jump. Because there must be a gap (usually about four inches) between the water surface and the lid, your aquarium will not be filled all the way up. Remember this when calculating how many fish it can hold. Your aquarium set-up will also need a filter system, a light and a heater. They are many variants of each of these in the shops. For your first aquarium, avoid elaborate systems. Think first about how you can clean and maintain your equipment. Fish don't live in their aquarium all alone. In order to be healthy, they need to share it with microbial organisms. These organisms need to be established first before you can safely add fish. Most of them will live in the substrate, the gravel or sand that covers the bottom of your tank. This should be added at the start of the setting-up process. Avoid peaty substrates in your first aquarium. If you just fill up your aquarium with water and leave it, the necessary microbes will gradually find their way to it through the air. A faster method is to ask your local fish shop, or a friend with a healthy aquarium, for a small amount of their substrate to add to your own, to 'seed' it. Give your aquarium about three weeks to establish a microbe colony before you add fish. It's important not to stress your ecosystem by adding too many fish at once. To begin with, add just two or three hardy fish. The microbes will then feed on their waste and the ecosystem will develop. To make sure your fish don't feel too vulnerable on their own (stress can lead to illness), you should add some plants so that they have places to hide. Change a fifth of the water every week, or do two or three equivalent smaller water changes at more frequent intervals. This will get rid of toxins produced by the microbes. Because tap water contains chlorine, which is bad for fish, you should let it stand overnight or treat it with a special chlorine remover before you add it to the tank. The final stage of setting up your aquarium is to add the rest of your fish. 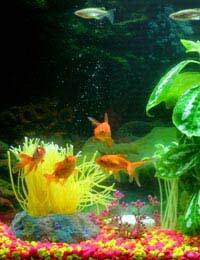 By this time your first few fish will see the aquarium as their territory and may defend it, so move around plants and decorations to make it look less familiar. This will reduce the risk of conflict. Add your new fish in twos and threes. This will make established fish happier about accepting them. Leave a gap of about a week between introductions to let the ecosystem adjust. Welcome to the world of aquarium fish keeping!